FaithQuest is joining forces with the Love Spain campaign on the 2019 Canary Islands Cycling Tour on behalf of the missional outreach via the Rivas Light and Life Cultural Center in Rivas Vaciamadrid, Spain. FaithQuest is organizing a team to participate led by John and Lori Gash, founders of FaithQuest. Sign up and ride with us for a great missional cause where you will also be inspired by international speakers on the front lines (Jordan, Uganda, El Salvador) of mission outreach!! Read on!! Please check out the daily details of our FaithQuest Love Spain 2019 Canary Islands Cycling Tour itinerary from June 9-23, 2019 below. The route covering three Canary Islands - Lanzarote, Fuerteventura, and Tenerife - is 522 kilometers long over eight cycling days, which averages out to 65 kilometers (40.5 miles) per cycling day. The itinerary also includes four rest days to allow for ample enjoyment of the places we will be. Although stages are relatively short in length/duration to save afternoons and evenings for sightseeing and group activities, most days will involve substantial climbing, so will be challenging enough for all level of riders. Anyone with a moderate level of fitness should be able to complete the trip. Road bicycles are strongly recommended. For more technical details about the trip, consult the blog for occasional updates. We will be staying in high quality hotels and resorts on all nights save for house accommodation the final two nights in Madrid. Accommodations throughout will be centrally located and extraordinarily relaxing allowing you to mix biking, great scenery, tourist attractions, comfort, and a great cause! Each registrant's fee helps us pay for a half scholarship for a Rivas Light and Life Cultural Center student and participants are encouraged to raise the half scholarship match ($360). To download a summary sheet of the Love Spain 2019 Canary Islands Cycling Tour, which contains a summarized version of the calendar, including all accommodations and routes, click here. We start on Lanzarote . . .
continue on Fuerteventura . . .
All participants need to fly into Arrecife, the capital of the island of Lanzarote - arriving mid afternoon at the latest. Our hotel, the Hotel Lancelot Playa, is less than a 10-minute drive from the airport and can be easily reached via taxi. Our hotel is right across the street from the beach and convenient for exploring Arrecife. In the afternoon and evening, we will get the bicycles ready, and convene for dinner at a local restaurant for introductions and instructions. After breakfast, we will depart for an 82-kilometer loop up to the north end of Lanzarote and back. On the way north, there are potential stops at the Cactus Garden, an underground cave (Cueva de los Verdes), and a beautiful lookout on the north end - the Mirador del Rio. As you double back we progress through the small town of Haria and make a stop at the artist Cesar Manrique’s studio. Manrique’s artwork is on display throughout Lanzarote. 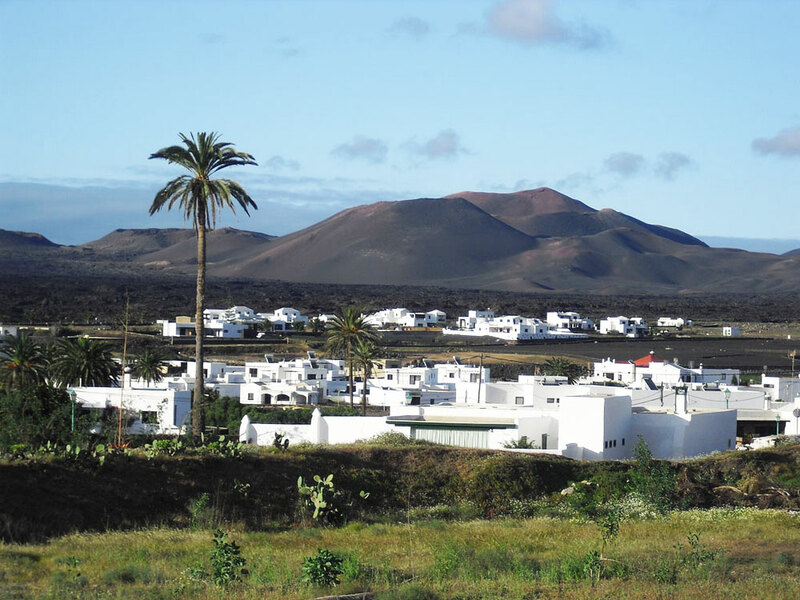 There is a significant climb out of Haria to a high point at nearly 600 meters before winding our way back down to Arrecife and the Hotel Lancelot Playa for another night. To view and download the Strava route, click here. To download the Strava cue sheet, click here. To download a Google Maps route map of the day's cycle, click here. Our 64-kilometer route will feature volcanic landscape. Our first stop just outside of Arrecife will be Cesar Manrique’s house, which is built in the middle of a lava field. We will then visit the stunning Timanfaya National Park with its active fumaroles and volcanic landscape. We will continue past this lunar landscape to the coast to Los Hervideros, where a dried lava flow meets the sea and has resulted in many interesting formations. We continue past an old salt plant and finish in the town of Yaiza, at our hotel La Casona de Yaiza. To view and download the Strava route, click here. To download the Strava cue sheet, click here. To download a Google Maps route map of the day's cycle, click here. Free day to enjoy staying at La Casona de Yaiza, enjoying nearby lava field vineyards, and potentially going to the beach at Playa Blanca. Time to relax, recuperate, and get to know each other better in a beautiful setting. Our cycling day is divided into two parts. The first part is on Lanzarote for 17 kilometers as we head south to the ferry port at Playa Blanca where we will board the ferry for a 30-minute ride to the island of Fuerteventura. 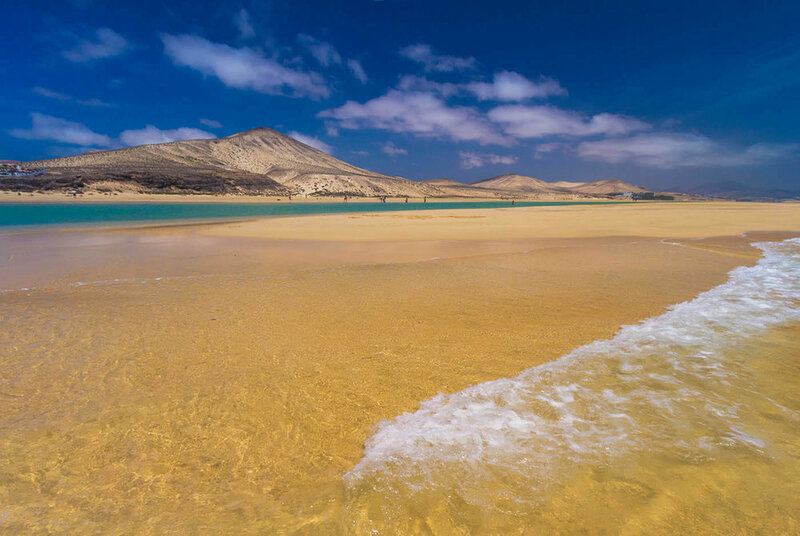 Fuerteventura is known for its beautiful sand beaches and crystal clear water. We will view this as we ride south for another 45 kilometers along the coast past the beautiful sand dunes in the Parque Natural de Corralejo, through Puerto del Rosario, Fuerteventura’s capital, to our hotel, the Sheraton Fuerteventura Beach Resort. To view and download the Strava route for part one, click here, and for part two here. To download the Strava cue sheet for part one, click here, and for part two here. To download a Google Maps route map of the day's cycle for part one, click here, and for part two here. Free day at the Sheraton Fuerteventura Beach Resort to relax, enjoy the beautiful grounds and beach. In the evening, we will likely be hosted by a local church in Puerto del Rosario for a typical Canary Islands dinner. We will ride south along the coast of Fuerteventura for 82 kilometers to the port at Morro Jable, where we will take a 4:00 P.M. ferry for 6.5 hours to Santa Cruz de Tenerife, where we will be staying at the Hotel Nautico which is about 700 meters from the ferry arrival port in Tenerife. To view and download the Strava route, click here. To download the Strava cue sheet, click here. To download a Google Maps route map of the day's cycle, click here. 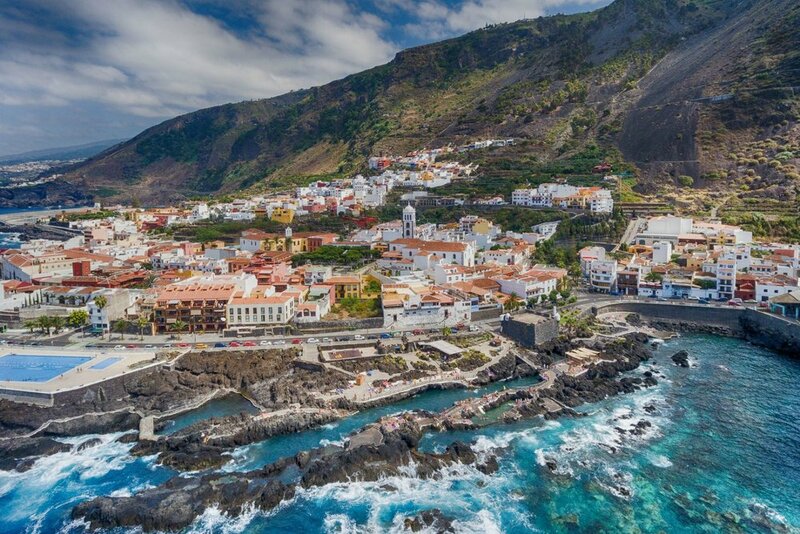 On our first riding day on the island of Tenerife (64 kilometers), we will climb steadily out of Santa Cruz de Tenerife before descending again to the coastal town of Garachico, often voted the most beautiful town on Tenerife. We will be staying at the luxury boutique Hotel La Quinta Roja. Garachico boasts several unique bathing pools in a lava flow filled with sea water. To view and download the Strava route, click here. To download the Strava cue sheet, click here. We will begin the day by climbing straight up out of Garachico to a pass at 1,100 meters elevation before hitting some rollers, another small climb, and a significant downhill to the tourist town of Adeje on Lanzarote’s south coast where we will finish after 56 kilometers at the Sheraton La Caleta Resort & Spa. To view and download the Strava route, click here. To download the Strava cue sheet, click here. After three days of cycling and a significant ferry transfer, the rest day at the Sheraton La Caleta Resort & Spa will feel great! The hotel has many amenities including great restaurants, a miniature golf course, and many stores, restaurants, and beaches are close by. This will be a chance to get ready for the largest climb of the trip - up the slopes of the Teide volcano the following morning. This could possibly one of the most memorable riding days of the tour, as we climb steadily for 40 kilometers from the coast up the slopes of the Teide volcano before reaching our destination after 51 kilometers of total riding at the Parador de las Cañadas del Teide at about 2,100 meters elevation. Many professional cycling teams base themselves at the Parador to do altitude mountain training as they prepare for the grueling professional schedule. Truly, an unforgettable ride. To view and download the Strava route, click here. To download the Strava cue sheet, click here. This will be our final rest day to enjoy our time at the beautiful Parador de las Cañadas del Teide, within direct sight of the Teide volcano summit. There are a lot of good hiking trails in the vicinity and a great chance to relax in the shadow of the highest summit in Spain. 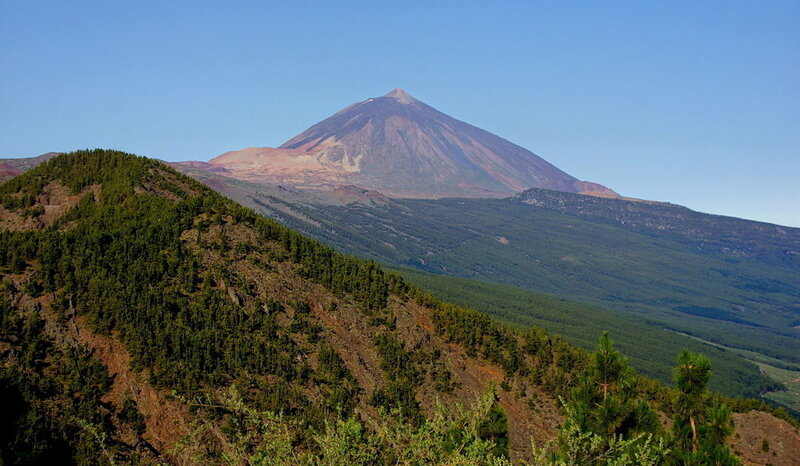 Our final cycling day (all good things must come to an end) will take us along the plateau below the Teide volcano summit before a significant descent from 2,100 meters to the Tenerife North Airport at 600 meters elevation - a ride of 61 kilometers. We will then pack our bikes and take late afternoon/early evening flights to Madrid where we will be staying in private homes in Rivas Vaciamadrid. To view and download the Strava route, click here. To download the Strava cue sheet, click here. On our last full day together, we will undertake activities with the Rivas Light and Life Cultural Center, enjoy a pool party and paella lunch, pack bags, and have a chance to enjoy an evening tour of Madrid. Time to say goodbye! Everyone flies home. The tour officially ends after breakfast. We will make sure you are transported to the Madrid airport in plenty of time to catch your flight. In order to become an official participant in the FaithQuest Love Spain 2019 Canary Islands Cycling Tour, everyone must register and pay below. Scroll down on the registration filling in all items as you go. Once you have completed the registration, proceed to make your payment. The total cost of the FaithQuest Love Spain 2019 Canary Islands Cycling Tour is xxxx euros payable via xxxx. This payment includes a 5% credit card processing fee. Payment covers all internal Spain travel during the trip including the flight from Tenerife to Madrid, ferries between Lanzarote and Fuerteventura and between Fuerteventura and Tenerife, vehicle backup, lodging, cycling and/or dri-fit attire for participants who have not previously been on a Love Spain event, and breakfasts during the entirety of the trip starting from lodging on the night of June 9, 2019 and ending with breakfast on June 23, 2019. Lodging will normally be high quality hotels (double occupancy) with the exception of the final two nights in Madrid in private homes . Payment does not cover international travel, lunches, dinners, tips, snacks, drinks, entrance fees, and incidentals. All payments are fully refundable (less processing fee) prior to April 15, 2019 and transferrable but entirely nonrefundable after April 15, 2019. THE FINAL DEADLINE FOR FULL PAYMENT FOR ALL PARTICIPANTS IS April 15, 2019. We encourage everyone participating to bring their own road bicycles. For a limited few cases, we may be able to find rental bikes for participants at a cost of 260 euros for the trip, but this is not guaranteed. Contact us if you think you will have difficulty finding a bicycle for the trip and we will try to help. Thank you for your interest in the Love Spain 2019 Canary Islands Cycling Tour. If you have any questions or we can help you in any way, please do not hesitate to get in touch via the Contact Us page. Please note that you will not be considered fully registered for the FaithQuest Love Spain 2019 Canary Islands Cycling Tour until you have fully completed and submitted your registration below and made your trip payment. In the past, places have filled up quickly so the earlier you register and pay the better. Please provide the best way to contact you by telephone if we need to. (Include country code). Please provide the name, email, phone number, and relation to you of an emergency contact. We require all participants to carry international travel and health insurance for the Love Spain 2019 Canary Islands Cycling Tour. Please check below to acknowledge that you are required to have your own travel and international health insurance for this trip. (Please check box below). I will make sure I have international travel and health insurance coverage for the Love Spain 2019 Canary Islands Cycling Tour. Please scan or photograph and email a copy of your passport's photo page to us at info@visionquestride.org. We need this in advance to make reservations and do advance check in at hotels on the trip. Your payment for Love Spain 2019 Canary Islands Cycling Tour is refundable until April 15, 2019 and nonrefundable after that. However, your payment can be designated for another person going on the trip if you reach an agreement with that person. As mentioned previously, we recommend all participants obtain travel insurance that covers loss of revenue due to unexpected cancellation after April 15, 2019. Please check box below. I understand that my registration fee is 100% nonrefundable after April 15, 2019. The Love Spain 2019 Canary Islands Cycling Tour is run on a non-profit charity basis. All participants join the ride fully at their own personal risk and no organizing person or organization bears any legal or financial liability of any sort for any mishaps that may occur during the Love Spain 2019 Canary Islands Cycling Tour. I understand that I am solely responsible for my own well being during the Love Spain 2019 Canary Islands Cycling Tour and no other party except myself bears any legal or financial responsibility in the unlikely event of any mishap (physical or financial) that may befall me during the Love Spain 2019 Canary Islands Cycling Tour. I am participating in this activity fully at my own risk, and neither myself, family members, relatives, or friends have any right to hold any and all other parties or organizations liable for any potential harm to myself as a result of my voluntary participation in the Love Spain 2019 Canary Islands Cycling Tour. Everyone on the Love Spain 2019 Canary Islands Cycling Tour who has not been on a previous Love Spain cycling tour will receive a cycling jersey and shorts the cost of which is included in your registration fee. Non-cyclists who have not previously participated in a Love Spain event will receive a dri-fit shirt. The jersey, shirt, and shorts will be pro quality, made in Spain. As a result they are European sizing which tends to run smaller than USA sizing. The rule of thumb for jerseys, shirts, and shorts is to go one size up from cycling attire you would buy in the USA, and two sizes up from "normal" clothing sizing. So, for example, if you wear an L size cycling jersey made in USA, order an XL. Please check one box for your jersey size and one box for your shorts size below. Thank you for successfully submitting your registration to the Love Spain 2019 Canary Islands Cycling Tour! It's going to be great! Don't forget to pay to make sure you are fully registered and your place is reserved before the event fills up completely. See you on the ride. To be filled out by FaithQuest with explanation.